Occasionally you freeze into a fixated zone during a gig where nothing else matters apart from the performance you are marvelling at. 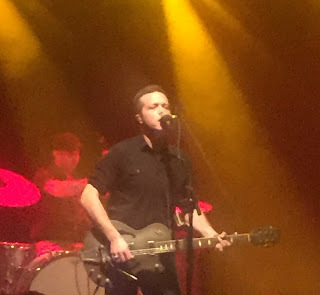 That state of mind was frequently entered during this Jason Isbell show in Bristol and not always during the songs that you would personally predict beforehand. Just witnessing Jason pour absolutely everything into ‘Cover Me Up’ will without doubt court popular appeal during this tour, but to feel that that particular moment was surpassed is a rare treat. To borrow the political phrase ‘first among equals’, ‘The Life You Chose’ soared up the lofty Isbell ladder to crown a performance delivered by unequivocally the coolest and must humble performer in Americana music. This was Jason’s second UK date on the European tour to support the album which has elevated his status to wider appeal. Without too much knowledge of the Bristol live music scene, the decision to move the show to the O2 Academy seemed a wise one by the packed in feel to the place. Surely it can’t be long before a promoter brings him to a midsize Birmingham venue as no doubt a market now exists as evidenced by the number of people making the trek down the M5. 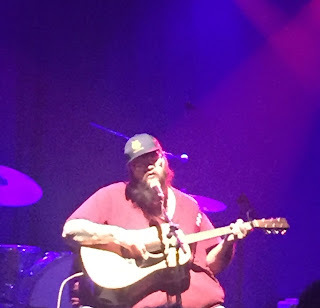 The trip was certainly worthwhile, as in addition to over an hour and half of Jason rocking the joint with the ubiquitous 400 Unit, we had the pleasure of John Moreland sharing his songs for forty minutes with stirring effect. With HIGH ON TULSA HEAT finally getting its UK release the previous week, it was fitting that Moreland announced his arrival with ‘Hang Me in the Tulsa County Stars’. Later in his set the performance peaked with a rendition of ‘Nobody Gives a Damn About Songs Anymore’ lifted from an earlier record which had warmed the hearts of listeners this side of the pond. The song delivery was entirely free of pretension with the raspy vocals projecting a large degree of deep felt emotion savoured in a state of immaculate reception by a vast majority of the audience. This was song writing and performing in its purest form leaving the thought that there must be something in the Oklahoma landscape to enable a writer to tap into the inner seam of lyrical brilliance. Following in the travelling footsteps of fellow State artists John Fulbright and Parker Millsap, John Moreland announced an unmissable arrival and an imprint to accommodate the magnitude of his compositions. On his previous visit to these shores, Jason played a duo show with his wife Amanda Shires at the Cambridge Folk Festival and it was interesting to compare the version of ‘Travelling Alone’, complete with fiddle, to the full band version featured tonight. On an evening where the 400 Unit soared into a prime tuned rock ‘n’ roll accompaniment, perhaps the fiddle was occasionally missed especially when the throttle was relieved a little. Striding back onto the stage for the inevitably deserved encore demand, Jason tore straight to the hearts of many present with a stunning version of ‘Elephant’ before choosing a mild mannered mid-tempo rocker to bid farewell in ‘Codeine’. Earlier in the evening Jason had announced his arrival by introducing the band and himself from Muscle Shoals Alabama before launching straight into ‘Stockholm’ and ‘Palmetto Rose’. A band he definitely loved this evening was the four guys in his stage vicinity led by the guitar virtuosity of Sadler Vaden, with whom Jason pushed to the limit with his own playing at times. Bassist Jimbo Hart was introduced as a friend of twenty years with recollection of the pair parking school buses in Alabama many years ago. On a couple of occasions, Derry de Borja stepped from behind the keys to extol the romance of the accordion. Full apologies for mentioning drummer Chad Gamble last but a roomful of music connoisseurs fully understand and appreciate the engine roll of the guy with the sticks. On the subject of home states, ‘Alabama Pines’ stood like a beacon mid set and we were dealt with a further dose of the past when ‘Decoration Day’ and ‘Never Gonna Change’ saw full respect given to the Drive By Truckers days. Bringing things right back to the present and as you would expect many songs from the highly acclaimed and commercially successful SOMETHING MORE THAN FREE were integrated into the set list. Apart from the track mentioned in the opening paragraph, ’24 Frames’ sounded as good as ever in justifying its place as the records promo track at the time of release. ‘If It Takes a Lifetime’ continues to teach many how to write a great country tune and ‘Hudson Commodore’ delivers the perfect lesson in nostalgia. Hearing all these songs live within the confinement of a first rate venue sound system capped the pleasure from first listening to the album in a feeling of mid-summer awe. From memory there is a recall of the set list containing ‘Speed Trap Town’, ‘Children of Children’ and ‘Something More Than Free’ but no doubt full listings will appear in other sources. However the factual element is only part of the excellence of this show, it doesn’t convey the feeling of entering that zone when you know a band, a songwriter and performer is on top of their game. Twenty days into a new year and the bar has almost disappeared out of view in terms of matching the aura of live band music. Although watching many challenge this peak over the next twelve months severely wets the appetite. Jason Isbell is a standard bearer for a contemporary movement and, though he will just brush it off as a normal guy from Alabama writing songs and playing music for a living, many will vouch for this concluding listener viewpoint.